This quote by George Davis (Kichnáalx—Lk’aanaaw) of Angoon led the opening Sealaska Heritage Institute conference in 1980. The organisation exists to “perpetuate the Tlingit, Haida, and Tsimshian cultures,” with a more recent primary focus on language restoration. Currently the Institute is running a project entitled: The Bridging Challenges to Fluency through Partnerships: A Tlingit Mentor-Apprentice Language Program, focusing on increasing the number of fluent Tlingit speakers through a mentor-apprentice model of immersion. 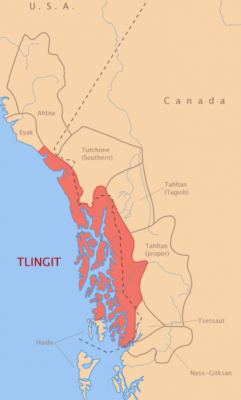 Tlingit is a language spoken by the indigenous peoples of Pacific Northwest coast of North America, or what is today Southern Alaska. It is, according to UNESCO's categorization, a severely endangered language. The Sealaska project has organised 6 mentor-apprentice teams, each of which includes a fluent Tlingit speaker and one language learner (apprentice), spread across three southeast Alaskan communities. The project, which will be ongoing for 3 years, hopes to use this immersion method to develop a strong, community of young Tlingit speakers, and builds on a growing group of young people studying the language – today 500 in the local school district alone. It is a program based on work by the First Peoples’ Cultural Council. Developing a young generation of fluent speakers is vital to the survival of endangered languages. According to Jasmine James, Sealaska's program coordinator, of the 200 fluent speakers of the Tlingit language in the world, only two are under the age of 60. 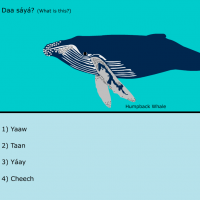 The institute has also developed a large number of Tlingit, Haida, and Tsimshian language resources available online, including dictionaries, instruction and phrase books, and language curriculum for classrooms and camps. Their resources include a number of interactive Flash-based learning tools, teaching users theme-led words, such as animals, household items, and numbers. 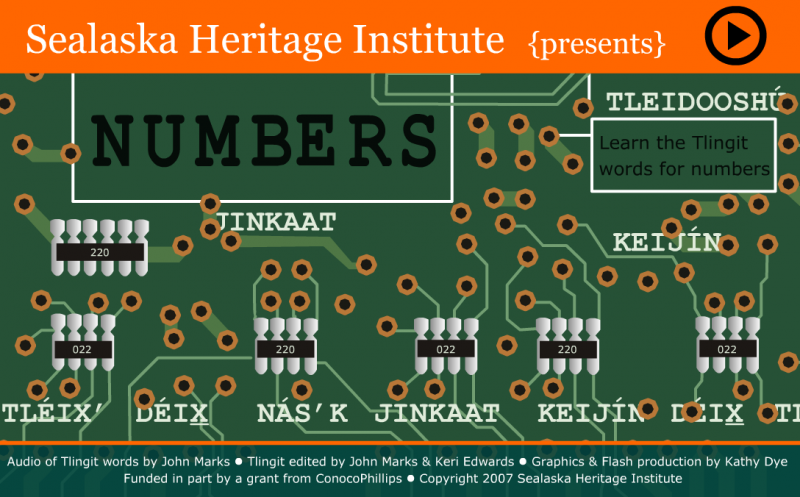 Front page of Sealaska's Flash-based resource to learn numbers in Tlingit. The institute is also transcribing its archives of Tlingit oral narratives to be used in future by language learners. The organisation works on other campaigns as well, including a public advocacy program to help promote Native languages at the state and federal policy levels, publications of resources, and video recordings and transcriptions of local Council of Traditional Scholars meetings, conducted in Tlingit. 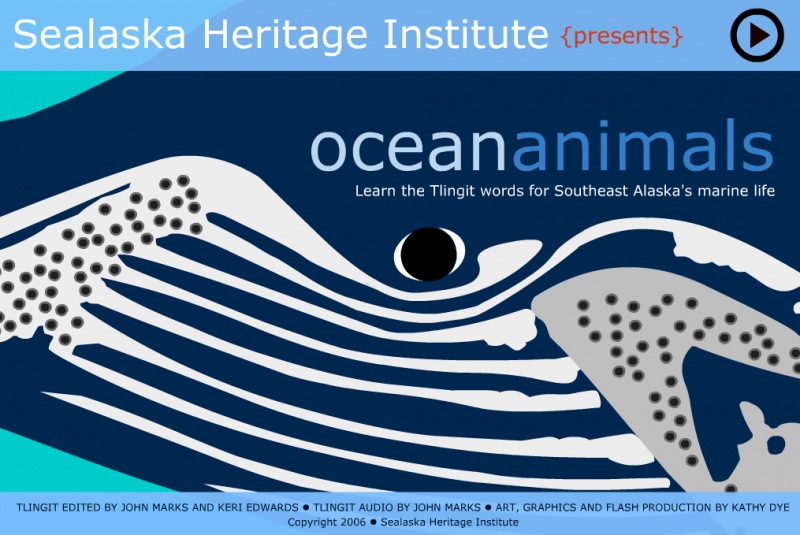 You can keep up to date with the Sealaska Heritage Institute through their Facebook page and on Twitter @SHInstitute.